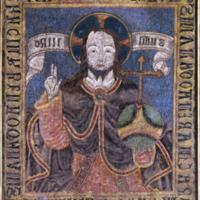 With fingers raised in blessing and left palm resting upon an orb, this image of Christ as Salvador Mundi ("Savior of the World") is made of feathers and gold. Indigenous craftsman created it in central Mexico, working under the watchful eye of European-born friars. Although called a “feather painting,” the technique is closer to mosaic, with feathers glued onto a paper base made of amatl (indigenous-made paper) or cotton. The shimmering quality comes from the feathers. Under-feathers were sometimes dyed, but the top layer was not. Feathers came from both local birds and ones only found in tropical zones of the country, like parrots and quetzals. 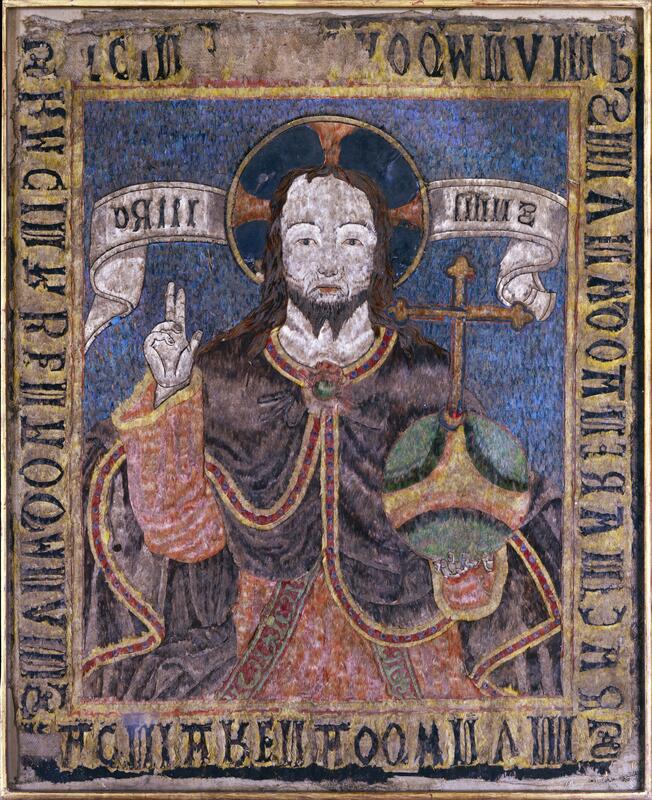 The visual model for the Christ with a hand raised in blessing was most likely a European print, perhaps an engraving friars brought to New Spain. The orb with a cross on top symbolizes Christ’s role as savior of the globe of the earth. The letters around the edge do not add up to a meaningful text, and may have been a Nahua craftsman’s creative appropriation of the Latin alphabet. The friars who commissioned such Christian works did so for many reasons, including their own aesthetic appreciation of Aztec feather-working. In addition, they needed to demonstrate—both at home and abroad— their “success” in converting native people and in turning indigenous hands to Christian work. The indigenous craftsmen who made works such as the Salvador Mundi must have had their own ideas about such creative projects. The translation of a Christian print into an image of feathers and gold required they re-imagine the purposes and aesthetics of traditional, pre-Hispanic feather working. The techniques for working feathers into images are of pre-Hispanic origin. In the century before this work was created, Aztec imperial rulers commissioned feather paintings of extraordinary beauty and craftsmanship, prized for their ephemeral and shimmering qualities. The multi-colored feathers that comprise this painting were acquired via trade networks established in pre-Hispanic times but still extant in the 16th century. While many feather paintings were sent to Europe and treasured by collectors, this one seems to have remained in Mexico, where it is now. The original context of this work is not known, but scholars believe it hung upon a sanctuary wall, where lighting by candles would have further enhanced Christ’s otherworldly appearance. While Christian iconography was a recent introduction in 16th-century New Spain, the use of feather-works in religious rituals, including those involving sacrifice, had roots in the pre-Hispanic past. Thus, in the creation of the Salvador Mundi, its creators joined in the long, and often inchoate, process of recasting indigenous beliefs and practices into new parameters established by the colonial church and state. At the same time, the friars expanded their own notions of aesthetic beauty and possibilities for religious expression. Estrada de Gerlero, Elena Isabel. 1994. “La plumaria, expresión artística por excelencia.” In México en el mundo de las colecciones de Arte, Nueva España, Tomo 1. Mexico City: El Gobierno de la República, p. 72-117. Russo, Alessandra, 2002. “Plumes of Sacrifice: Transformations in Sixteenth-Century Mexican Feather Art.” RES 42 (Autumn): 226-250.